Knowledge maps visualise the organisation of care and the experiences of patients with healthcare. 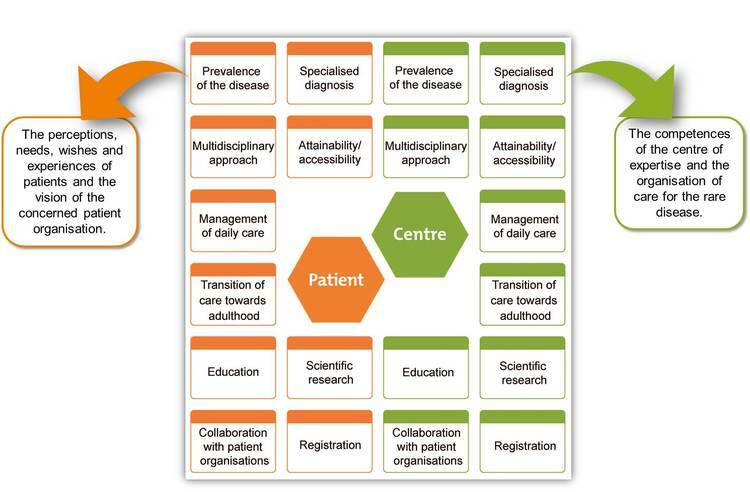 To arrange all this information properly, the knowledge map is divided in two sections: the experiences of patients (orange section) and the organisation of care (green section). In both sections we discuss ten topics, based on EUCERD Quality Criteria for Centres of Rare Diseases. In the image you can see the ten topics on each side. If there are more centres of expertise for one rare disease, each centre will get their own knowledge map. Learn more about the method to develop a knowledge map.